These black-and-white prints were all given to offered to the artist Sam Szafarn and his wife and son, Lilette and Sébastien, by Henri Cartier-Bresson during a thirty-year friendship which flourished on impassioned discussions, shared meals, strolls in Paris, and the odd falling out. In an astonishing way, this collection is a rather faithful reflection of the whole of the work of Henri Cartier-Bresson. It includes photographs of youth, great meetings, historical moments, local landscapes, remote countries, beloved faces and also of artists, writers, and others. 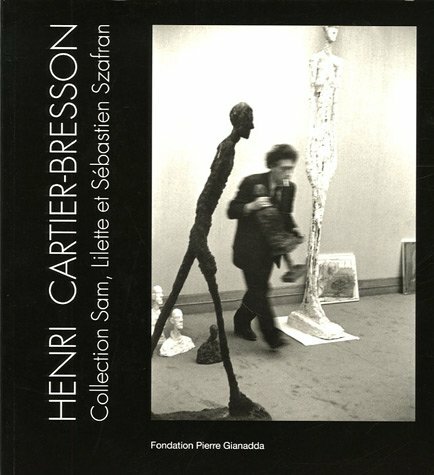 Pierre Bonnard, Henri Matisse, Alberto Giacometti, Francis Bacon, Richard Lindner and Lap Sze-To, James Lord, René Char, Gerard Régnier, Jean Clair, Louis-René des Forêts,Man Ray, Robert Doisneau, and Martine Franck all appear in these pages. Many of the photographs are dedicated to Sam or Lilette, and occasionally even to Sébastain. Plays on words, puns or schoolboy rhymes all evoke the initmacy of the realtionship between Cartier-Bresson and the Szafran, a friendship that lasted until the photographer's death. In French.